What I love about visiting Vietnam is that I can eat so much great food – and don’t put on any weight. All the salads, rice rolls and fresh herbs are so light and tasty, most of the dishes I eat tend to be steamed or boiled and there is only little fat and oil. I can actually eat three meals a day and more, without any problems. Of course, I have to be careful when it comes to the coconut ice cream coffee, as that’s a completely different story! 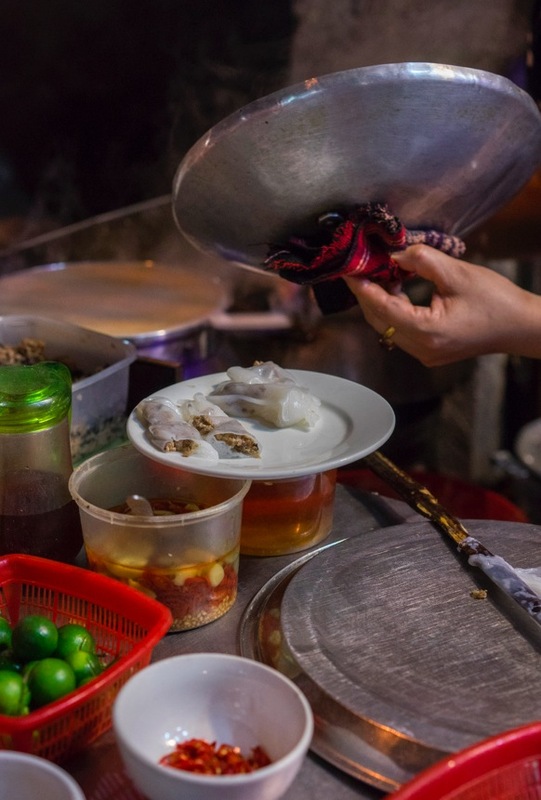 You can find good food almost everywhere in Hanoi – but to make sure we were off to the best start, we booked a street food tour which is a great introduction. Hanoi Street Food Tour costs 20 USD per person and lasts about three hours. It included nine different stops, from soups, noodles over to beer and sugar cane juice as well as dessert and coffee. Food is plenty and our guide was very knowledgeable. As we were only in a group of four that night, we could ask him a lot of questions and he was very happy to give us answers! Bun cha – this is THE classic dish to try in Hanoi and needs to be tried, at least once, if not several times. It is barbecued pork in a sweet and sour soup with bun noodles and herbs on the side. We tried it in many different forms and many different places. At the foodie tour, we had it somewhere along Dinh Liet, which was just average. But the best and most famous is at 1 Hang Manh. Probably the most well know bun cha place in the old quarter and perhaps also the most expensive – but also with the biggest portion! Banh goi – This is also called “pillow cake” and is a popular street snack in Hanoi. It is deep-fried to have crispy and golden brown shell, stuffed with pork, shrimps and some vegetables. It’s served with sweet and sour fish sauce. The most famous place to enjoy Banh goi is at 52 Ly Quoc Su Street, next to the Cathedral. Pho – This universally famous food is best enjoyed in Hanoi, where it was invented in the early 20th century. Phở rice noodle soup is omnipresent in Hanoi and some is served with chicken and some with beef. The tip is, look for the place where locals gather the most and you know where you should order and sit down. If I remember correctly, we tried it at Pho Cuong at 23 Hang Muoi. Banh cuon – this is a freshly made, steamed crepe from rice flour and water. A savoury meal, the inside stuffing contains ground pork, wood-ear mushrooms and seasoning. Most street chefs make the dish right at door so look for a place that steams are coming up high – we tried it just somewhere on the street. There was a tiny food stall with a lady cooking, I’m not sure if there is actually an official address! But if you walk around the old quarter, you will see several Banh cuon sellers. Bun bo nam bo – We tried Bun Bo Nam Bo at a few places, it’s a simple tasty dish of bun noodles with beef, some lettuce and spring onions and nuts and crispy flakes on top. The most famed place to find it is called Bun Bo Nam Bo on 67 Hang Dieu. Actually, we found that the easiest way to try most of the street food dishes without having to sit down on miniature seats on the street was to go to Quan An Ngon which serves pretty much everything although a tiny bit pricier. The food is good and there’s lots of choice, and the surrounding is quite pleasant – if you don’t go at the typical lunch hour or dinner time. They have several branches in Hanoi, we went to the one that is close to the Railway station on 18 Phan Boi Chau Street. Finally, don’t forget about the drinks. Ca phe trung – this is something you have to try. Maybe only once, but at least try it. It is raw egg cafe! It is served in clear glasses, filled with over an inch thick of whipped raw egg and a bottom layer of black Vietnamese coffee. Some more black coffee is poured on top and then you can enjoy it – but be aware, it is very sweet and rich, with lots of coffee and sugar. 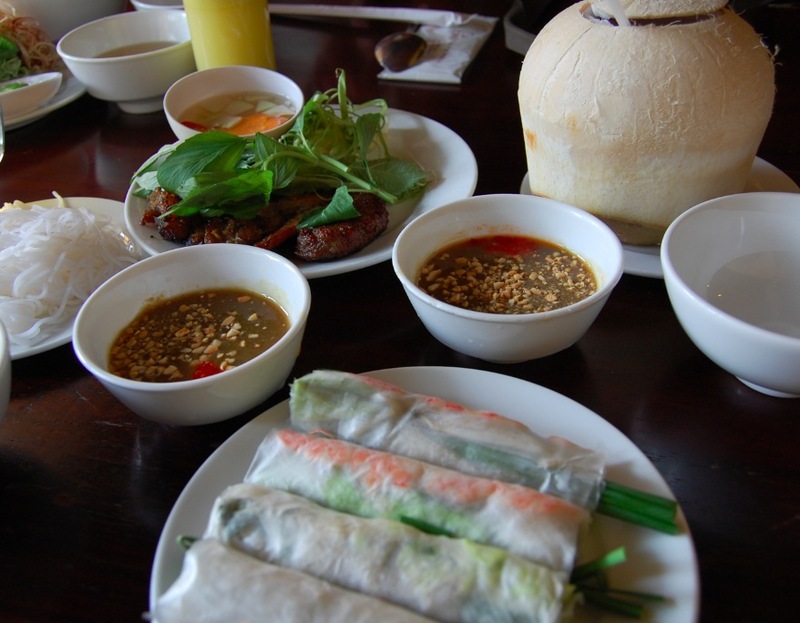 We tried it at Cafe Giang on 39 Nguyễn Hữu Huân, which is less touristy than the “Hidden Cafe”. 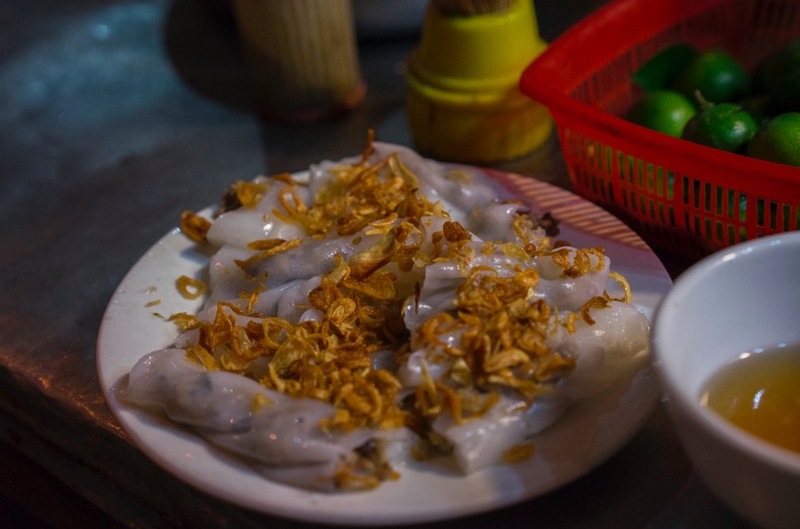 By the way, if you are looking for a Hanoi Street Food Map, check out Nonna Chong’s blog post, where she provides great tips and guidance about where to eat/drink in Hanoi. 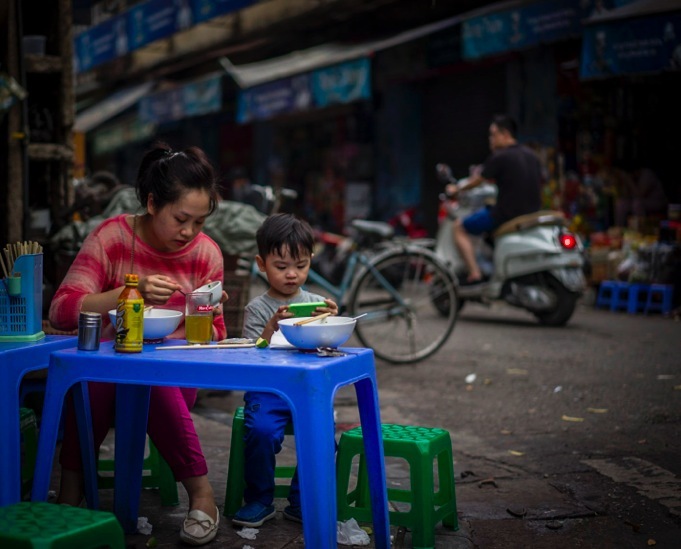 I think I should check out Hanoi some day ..
yes – it’s a great place for a few days of nice food and just wandering around the streets with your camera in your hands! Be careful in Vietnam right now! I’m already safely back in HK, but thanks for checking in with me! Love street food, especially in SE Asia. I got sick when eating cockles in Phuket about 13 years ago. Did you have any trouble eating seafood at the hawker stands? No, so far I’ve been lucky – but then all the seafood I eat usually tends to be grilled squid or fried fish, so I guess that is safer.